Tomorrow, in the US, is tax day. That means millions of Americans will be turning in their income taxes and, I’m betting if you’ve waited this long, not enjoying the day. Fear not, cocktails and the Cocktail Hacker have your back. So, finish your calculations, dump the whole mess in an envelope, stamp it, lick it closed and throw the damn thing in the mail box. Now is the time for a cocktail if there’s ever been one. So, how about this, the Income Tax Cocktail. Not only is it name appropriate, it’s damn good and will settle your rattled nerves. I sampled two recipes to give you a head start. Okay, that’s a lie. I sampled two recipes because this drink is damn good and I missed my old ways. So, here’s a head start, even if that wasn’t the reason behind it. This recipe is a classic. I found the same in the Savoy Cocktail Book and the recipe itself kinda cracked me up. Rather than reading 3/4 oz of Orange Juice the real recipe reads “the juice of 1/4 orange”. Wanting to make this more repeatable and comparable I opted for an exact measure. This drink is drier than you’d expect it would be. The vermouth is the star, despite having chosen a seriously bold gin. Very tasty, but I wanted something where gin was the star. Very similar on the surface, but the flavor is definitely different. Here the gin is the star. Make sure you go bold. The cocktail is still dry, but that dryness makes the drink very refreshing and crisp. 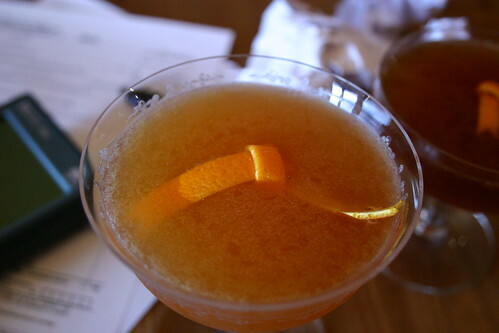 There is a complexity to this drink that is very telling of classic recipes. This is my choice of the two recipes. Income taxes are never pleasant, even when you get money back. But, I dare say, this drink will make the day better. Enjoy! Will you Nail or Will you Fail? I’ve gotten to do some cool stuff over the years being a cocktail hacker. I’ve been to Tales of the Cocktail (hopefully not the only time), I’ve been to exclusive tastings, I’ve been invited to distilleries, but last week I had a first, I was invited to be a judge for the Drambuie Nail or Fail Bartender Showdown. Very many thanks to Cynthia, Anthony and Christina. It was great getting to be a cocktail geek with you all. The party itself was epic. Eight local bartenders mixed up original, Drambuie inspired cocktails for the crowd and Drambuie also served up some of their classics. I think Drambuie is one of those ingredients that gets passed over more than it should. Sure, you know where to go when you’re looking for a rusty nail, but there are so many other applications. Drambuie can truly be a blank slate for a whole range of flavor profiles and the bartenders showed that with ease. We had a couple sours, a riff on the Old Fashioned, an incredible play on a grog and the winner, a cocktail that was reminiscent of a Manhattan with notes of bitter, sweetness and deep complexity. I don’t have those recipes just yet, but with summer fast approaching, I will share a refreshing recipe from Drambuie’s team, the Drambuie Fizz. This drink is deceptively simple but really delicious. What I really want to share this time isn’t recipes though, it’s tips for entrants in cocktail competitions. Sure, I don’t have hundreds under my belt, but I think I’ve got some pointers that’ll be valuable. 1) It doesn’t matter what brought you to the competition, remember that you’re representing both yourself and your establishment. Always put your best out there. 2) Presentation in the drink matters as much as, if not more than, your presentation in making the drink. 3) Make the contest ingredient the star. Sure your housemade bitters are great as are the unique ingredients but the contest ingredient has to shine, that’s the whole reason you’re there. 4) Vet your recipe to anyone who will taste it for you. Friends, long time regulars, family. Then, once you’ve got it nailed, stick to the recipe. 5) Make your recipe appeal to a wide audience. I love crazy flavors as much as the next cocktail geek, but does that guy that just walked into your bar for the first time? 6) Garnish! For the love of god, it finishes your drink. 7) Complexity doesn’t equate to superiority. Sometimes the simplest cocktail is the best. 8) Have fun. At the end of the day, you’re getting to mix great cocktails for people who are really going to appreciate them. Enjoy it.